Well, as you can see from the photograph here (which can be duplicated half a dozen times or more) I did not necessarily take her wisdom to heart. 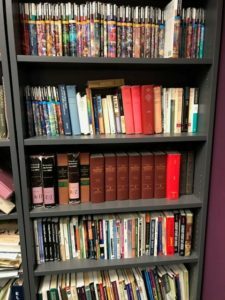 By now I have a theological library that is thirty years strong and growing. For that matter, I have been gifted with the books of others who reached retirement and in the process of weeding out their library, passed those ‘weeds’ along to me. Indeed, I think of the elderly pastor who was a member of the first congregation I served. Having moved into a retirement center, he had already gotten rid of most of his books. He had one small shelf-full remaining when his eyesight left him and he thought this (then) young pastor could use them. And he gave them to me. I still have most of them, even though the language used and insights shared are mostly far out of date. Even so, they tie me to him and his faithfulness and I cannot bear to let them go. I am a person of great wealth, in so very many ways, there is no question about it. Indeed, if I had not purchased all these books through the years. If only I had invested that money instead, I could probably retire far ahead of schedule. But those books. They represent possibility and knowledge and wisdom and community to me. I have believed (and often it has been so) that they help me to understand more deeply, to get closer to, the one the rich man calls “Good Teacher” today. Even so, my friend so long ago was on to something, it seems to me. It is tempting, it is easier, it is, in some ways, less risky, to first or only view Jesus through the eyes, the hearts, the experiences, the knowledge, the insights of others. It does not require as much of me as letting the story speak to me without the filtering lens of others’ insights. So it is with the rich rich man today we learn that he is weighed down. First by his limited understanding of what is required of him (in keeping the commandments) and then by all those possessions he has accumulated. And while keeping the commandments apparently has been safe and easy to measure, from what we can tell today, at some level he knows that it is not nearly enough. Something has been nagging at the edge of his understanding of his place in the world or he would not have approached Jesus at all. Something was getting in the way. Or something was missing. And, yes, it is the same for me. Perhaps that hunger for ‘something more’ lives in you as well. And so I wonder what it would be today if I were also to simply catch up with Jesus on the road. 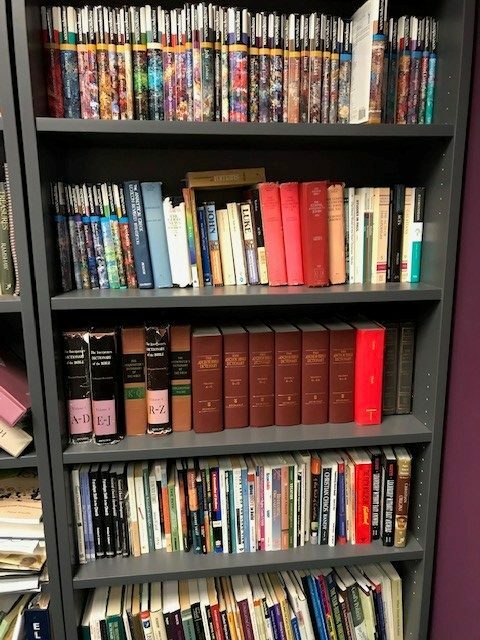 I wonder if Jesus would look at me with all of my books, all of my head knowledge, all of my ability to grasp what is so with my mind, and I wonder if Jesus, loving me, too, would tell me to take all of my books to the local thrift shop and to just follow him. To get my head out of the way so that he can get to my heart. For even that which is good, even that which is very good — like an advanced education and like having the means to tag along and go deep into the thinking, the reasoning, the wisdom of others far more learned than I — even that which is very good? It seems that is no substitute for simply encountering Jesus on the road and taking the next step and the one after that and the one after that in following him. I don’t know what that looks like for you, but for me, for now, it is to simply walk with the rich man and Jesus between now and next Sunday. It is to know that Jesus’ eyes also rest on me in love and that Jesus is inviting me to go deeper, to travel further than perhaps I ever have before. Oh, I am still not ready to get rid of my books, though. Even so, maybe I’ll leave them on the shelf for a few days and instead see where Jesus himself leads next. How do you hear the story of the rich man and Jesus? When Jesus looks at you, loving you, what is he inviting you to give away or leave behind? Indeed, in what ways are you rich? How does being rich slow you down or hold you back in your life and in your life of faith? What might it mean for you to simply walk with Jesus and the rich man in the days to come? As you press this story to your heart, what might you learn about Jesus, about yourself, about the world, and about your place within it? I’m glad, Elizabeth. Thank you for commenting. May God bless your walking with the rich man and Jesus in the days to come. Thank you Janet. You have give me much to pause and consider… Indeed I stand convicted in matters such as you described. May our Lord Jesus grant clarity and courage to walk in his ways.